Time Montage is the practical component of a research project conducted at Waikato Institute of Technology in Hamilton, New Zealand, for my masters degree in visual arts. I was originally inspired to undertake the project by the work of cinematographer, Ron Fricke, who pioneered the art of the moving camera time-lapse shot in such films as Baraka. When I saw this film projected in 70mm 20 years ago I was completely blown away, but at the time the technology and methods were far out of reach for the average photographer/filmmaker. I was happy enough at the time using multiple slide projectors synced by analog tape to provide basic montage on the big screen with cues to music. The relationship between imagery and sound has intrigued me ever since, and I’ve always wanted to continue exploring large scale means of delivering work. Fast forward to 2012 when I decided to begin my masters studies. While Fricke had just released his most recent film, Samsara, which was again shot on 70mm, advances in DSLRs and low cost motion control time-lapse gear made the basic technique available to enthusiasts worldwide. 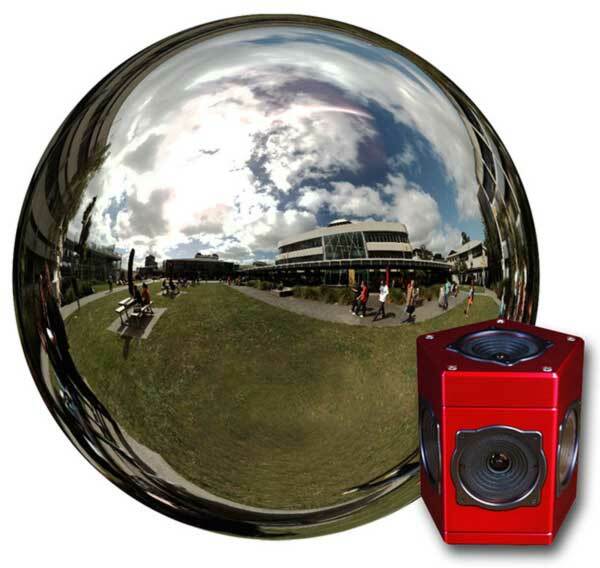 Having access to the Point Grey Ladybug3 panoramic video camera at Wintec, I was also initially interested in whether I could use the technology to simulate the 3D movement of a virtual camera in space and time. Preliminary experiments revealed that this was possible, but the quality and constraints of the technology prompted me to expand my area of investigation. Over the course of the degree my experiments have evolved to include: methods of 360 degree documentary, hyperlapse, motion controlled time-lapse with the Dynamic Perception system, traditional time-lapse with hacked point and shoot cameras (CHDK), 3D spatial controls with Kinect and Leap Motion, multi-screen output, use of Google Street View imagery as source material and more. My curiosity may have run a bit too wild, but overall I am happy with the end result. There’s something about time lapse that fascinates me. The hypnotic rhythms that reveal themselves; observing how light changes and interacts with various environments; the slices of hyper-real beauty that can be coaxed from the otherwise mundane; an alternative perspective of linearity. Time Montage is a montage of techniques, technology, sounds, music, imagery, and, of course, the glue that binds all of these elements together — time.